RALEIGH, NC -- North Carolina State seemed headed for overtime, quite possibly destined for its first agonizing collapse under new coach Kevin Keatts. Then Gabe DeVoe missed the game's most important free throw - and the Wolfpack escaped with a second straight Top 25 upset. Omer Yurtseven scored a career-high 29 points, and N.C. State held on to beat No. 19 Clemson 78-77 on Thursday night after DeVoe missed the third of three free throws with 0.2 seconds left that would have forced OT. "Listen, DeVoe's a great player, and he missed a free throw," Keatts said. "I'm excited that he did, but it certainly won't define what type of player he is. ... I'm glad it didn't go in." Allerik Freeman finished with 14 points for the short-handed Wolfpack (12-5, 2-2 Atlantic Coast Conference), who blew nearly all of a 12-point lead with less than 90 seconds remaining but held on to claim their second home win over a ranked team in six nights after knocking off then-No. 2 Duke on Saturday night. Omer Yurtseven had career highs in points, field goals made and three-pointers made for the Wolfpack, with 29 points on 12-of-18 shooting including 5-of-6 from three. "Could N.C. State win another good game after coming off a big game against Duke?" Keatts asked. "I thought we answered the bell." Marcquise Reed scored 17 points, Donte Grantham added 16 and Mark Donnal finished with a season-high 13 for Clemson (14-2, 3-1), which had its 10-game winning streak end. DeVoe scored four points in the final couple of seconds - but the Tigers needed a fifth one to get it to overtime. They were down by three points twice in the final minute, the last coming after DeVoe's layup with 1.3 seconds remaining. Clemson got the ball back after the officials ruled Torin Dorn's ensuing inbounds pass to Braxton Beverly bounced off the end line. Sam Hunt then fouled DeVoe as he flung up a 3-pointer from the corner. DeVoe hit the first two free throws, and after Keatts called a timeout to ice him, the Clemson guard bounced his last attempt off the left iron. "That wasn't the reason we lost," Tigers coach Brad Brownell said. "You feel awful for him, but that's not why we lost today." Clemson: The Tigers' pursuit of school history is over. They were trying for their first 4-0 start to ACC play since Rick Barnes' 1996-97 team won its first five conference games on its way to a No. 2 national ranking that still stands as the school's best. Everyone will remember DeVoe's miss, but it might not have come down to that, had the Tigers not turned it over 17 times, leading to 20 points for the Wolfpack. 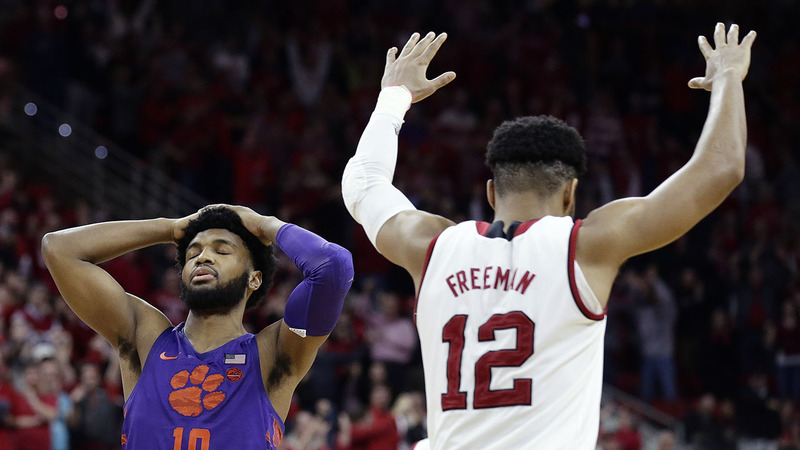 N.C. State: The Wolfpack sure seem to have righted themselves - at least at home, where they improved to 11-1 and avenged a 16-point road loss to the Tigers on Dec. 30. N.C. State had only eight scholarship players in uniform, and appeared headed for one of the more brutal collapses in recent school history before DeVoe's miss. Yurtseven was 12 of 18 from the field, and the 7-foot center hit a career-high five 3-pointers. He blocked four shots, had four rebounds - and didn't attempt any free throws. Clemson's turnover total. The Tigers finished two shy of the season worst they set two months ago against Texas Southern. Meanwhile, the Wolfpack turned it over just four times - equaling Reed's personal total. N.C. State guard Markell Johnson, who watched from the bench in sweats, has been cleared to return to the team after the dismissal of a felony assault charge against him in his home state of Ohio. Johnson had been indefinitely suspended due to a violation of the school's student-athlete code of conduct, but became eligible to rejoin the team when the charge was dropped. Keatts says he hasn't decided if Johnson will play at No. 3 Virginia on Sunday night because he hasn't practiced with the team. Clemson: Hosts No. 18 Miami on Saturday. N.C. State: Visits No. 3 Virginia on Sunday night.